Soccer coaching drills for the U5 age group! Soccer coaching drills for the U5 age group need to be fun whilst also delivering the important coaching points. This exciting game allows the young players to practice dribbling and passing the soccer ball. The game also allows the kids to use their imagination! You will need a marked out area wide and long enough for the amount of players you have available. You will need between 10-15 tall cones (flat cones will not work as well - however if these are all you have they can be turned upside down). The kids will need a soccer ball each. Divide the kids you have available into two groups both starting furthest end away from where the cones are. The cones will be down one end of the area stood upright and spread out as shown in the diagram. One group of kids will be King Kong's (giant apes) who love to knock down cones by kicking their soccer ball at them (demonstrate a correct pass using inside of the foot). The other group will be Bob the Builders who will have to 'fix' the cones by picking them up and standing them upright again. With cones and other players around, the kids will have to keep the ball close to them and take little touches. After a few minutes get the kids back to their starting position and swap the Bob the builder and King Kong roles. These types of soccer coaching drills are a good way to get many coaching points across. To progress slightly from this version you can have the Bob the builder group pick up the knocked over cone and instead of placing it back where they found it they could move it (whilst dribbling their soccer ball) to another place inside the grid. This will mean the King Kongs will have to change direction anddribble their soccer ball further. -> See if the kids can change direction by placing the bottom of their foot on the ball and rolling it behind them. This will eventually turn into the drag-back turn. Do this step by step with them! -> Make sure the inside of the foot is used when making a pass. 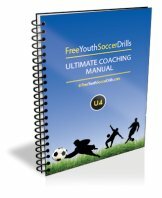 Click hear to see other U5 soccer coaching drills!